Danish physician and author; born in Copenhagen Nov. 26, 1756; died there April 6, 1844. He was a son of the physician Christian de Meza, together with whom he embraced Christianity in 1783. In the same year he graduated as M.D. from the University of Copenhagen, and became a member of the Royal Medical Society. From 1784 until his death he practised medicine in Elsinore. 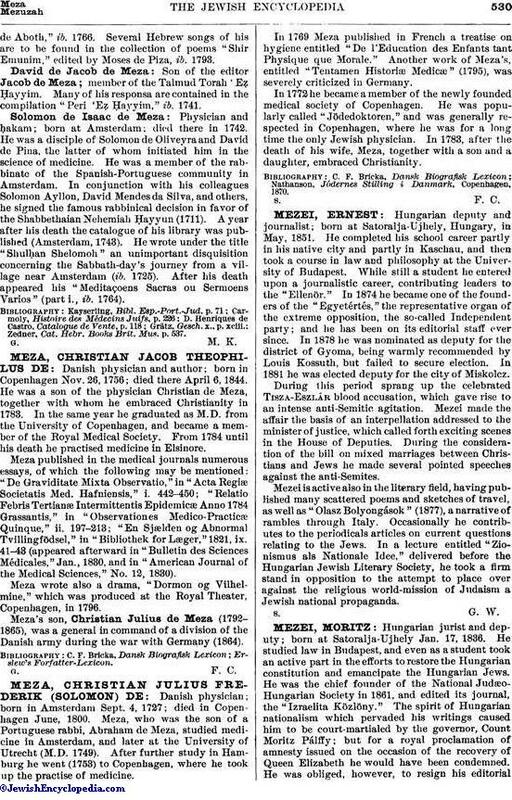 Meza published in the medical journals numerous essays, of which the following may be mentioned: "De Graviditate Mixta Observatio," in "Acta Regiæ Societatis Med. Hafniensis," i. 442-450; "Relatio Febris Tertianæ Intermittentis Epidemicæ Anno 1784 Grassantis," in "Observationes Medico-Practicæ Quinque," ii. 197-213; "En Sjælden og Abnormal Tvillingfödsel," in "Bibliothek for Læger," 1821, ix. 41-43 (appeared afterward in "Bulletin des Sciences Médicales," Jan., 1830, and in "American Journal of the Medical Sciences," No. 12, 1830). Meza wrote also a drama, "Dormon og Vilhelmine," which was produced at the Royal Theater, Copenhagen, in 1796. Meza's son, Christian Julius de Meza (1792-1865), was a general in command of a division of the Danish army during the war with Germany (1864).